I didn’t even plan for it to work out like this, but we’re really excited about our 100th review article! 1st: It’s amazing that 100 of these even exist and 2nd: To have this one be of a great brewery that adds our 5th country to the list is not something I ever thought we’d be doing 5 years ago. 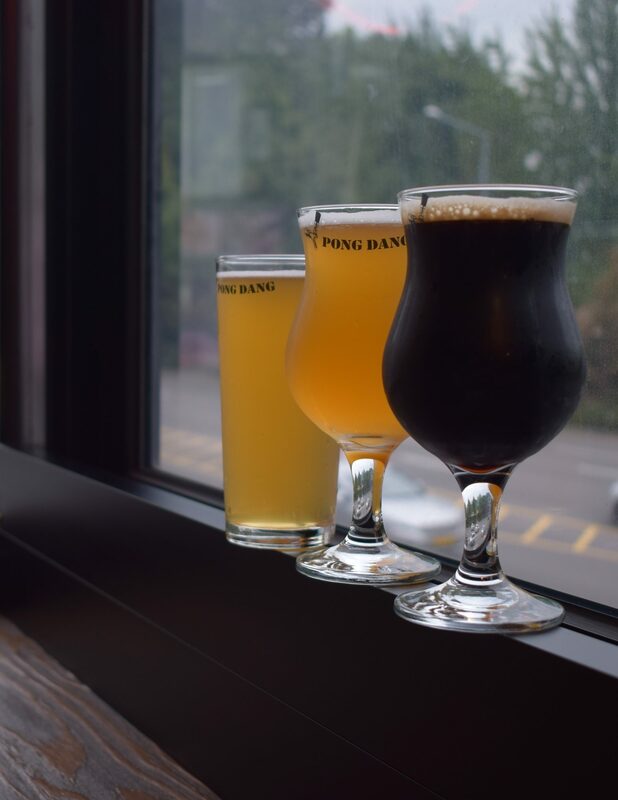 The first of many stops in Taipei’s emerging brew scene was Jolly Brewing. Just a stone’s throw from 2/22 Peace Park and the presidential office building- the brewery is in a cool part of town and boasts an industrial/rustic and very inviting atmosphere. Some soft bread with a peanut, curry dipping sauce and a spicy beef dish with a flight of six really tipped the scales in their favor. First up was the Weizen. To start this one is a filtered Weizen that I feel like bucks the trends a little bit and the cloves were strong and a bit overpowering. Secondly, it has some champagne effervescence behind it like the new string of brett IPAs. Nice work on this one. You know I don’t like pilsners. I still drink them because I’m still in search of the best of every beer I’ve ever had, also, duh, why would I waste it? This pilsner came pretty close. The Pale Ale was insipid. Or, shall we say, not very Jolly? Jolly’s stout had me hoping that a Korean brewer would take the 3-hour flight and take a couple of lessons. In recent months we’ve had stouts that had decent flavor and absolutely no mouthfeel (I’m talking water) and we’ve had some thick creamy stouts with NO flavor behind them. This stout wasn’t the best I’ve ever had, but after 14 months a poor stout performance, if we lived locally and this wasn’t the first stop on a vacation-activity packed night I would have stayed for 10 and gotten carried out. This guy was my favorite of the bunch. The Scotch Ale was sweeter than I’m used to and probably than any Scotsman would be. The Asian nations we’ve visited thus far seem to have a strong proclivity towards the sweet or savory while bitter falls by the wayside. That being said its richness kept me hanging on for the last drop. Lastly, their special release, 2016 Belgian IPA I found very intriguing. There were characteristics of both, with a light fruitiness at the beginning balanced by a delicate hop finish and a spice backbone throughout, but this was different than others of the style I’ve had. It wasn’t my favorite on the flight, but it was The Editor’s which makes it worth the trip. They rounded out the reasons why we loved this brewery with an advertisement urging their patrons that if they buy American beer to make sure the can or bottle has a label supporting independent craft brewers. All in all, I give Jolly an 8.9 out of 10. With Inbev gobbling up every brewer they can this is a great reminder for all of us back home in the US and abroad.